Posted November 19, 2014 by finnfemme & filed under Beauty, Fashion, Vintage. 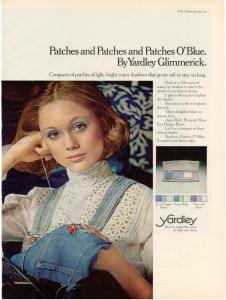 This is a quite lovely Yardley of London ad from 1973, featuring model Jane Hitchcock. It was for Patches O’ Blue Glimmerick water eye shadow. Compacts of patches of light, bright water shadows that go on soft to stay on long. Supposedly to match the mood of your days in denim. 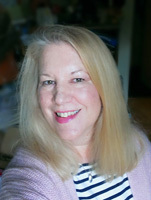 Jane is seen wearing a lacy Victorian-style blouse and denim overalls. She’s hand embroidering some denim jeans, which is what we all did back in the day. Denim anything was big in the ’70s. Jane was a very popular supermodel, and lent her beautiful face to many different cosmetic company ad campaigns. I never really bought into her as a specific ‘Yardley Girl’ model, when I saw her in so many other makeup ads. Seemingly, she was the last of the supermodels that advertised for Yardley of London cosmetics before they ended up phasing out their makeup line.